Pale Moon 27.4 has been released by the team responsible for the web browser, and is now available for direct download and automatic update. The new version of the browser introduces new features and changes to it; existing users may notice that most of the media streaming issues that some experienced should be fixed in this release for instance. Since Pale Moon 27.4 fixes several security issues as well, it is highly recommended to update the browser to the latest version as soon as possible to address those. Interested users can download the latest version of Pale Moon 27.4 from the official project website; existing users may select Pale Moon > Help > About Pale Moon to run a check for updates from within the browser. Tip: Check out our review of Pale Moon 27 as well. The team continued its work on the Media Source Extensions code, re-worked it, so that it is now spec compliant and asynchronous for MSE with MP4. The change should improve playback on the majority of video sites out there including YouTube, Twitch and Vimeo. New preferences were added to the options of Pale Moon that give users control over Media Source Extensions in the browser. Go to Pale Moon > Options > Content, and look for the Video group of preferences on the page that opens. 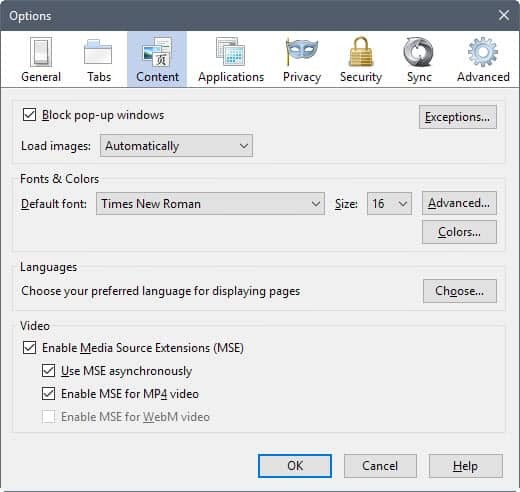 You may disable Media Source Extensions completely, or disable MSE for MP4, or asynchronous support there. Pale Moon 27.4 supports a new preference, media.block-play-until-visible, that users may enable to block video autoplay if the video that plays on a page is not in the visible view area. This needs to be configured on about:config, and is set to false. False means that videos will not be blocked from being played automatically if they are embedded in a non visible part of the web page. 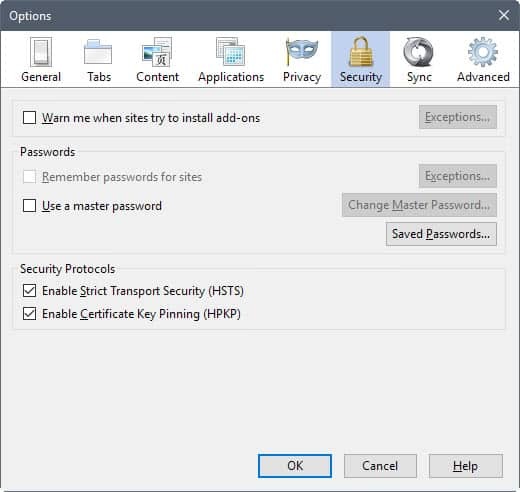 Another option that has been added to the options is control over the security features Strict Transport Security (HSTS) and Certificate Key Pinning (HPKP). Pale Moon users find options to disable these security protocols under Options > Security. The remaining changes resolve issues in the browser, add or improve support for new Web features, or improve Pale moon in other ways. The importing of bookmarks for instance picks up tags now from HTML bookmarks files if they exist, about:support features more information, and the Pale Moon Developer Tools support a new filter URLs option in the network panel. Some libraries have been updated to improve security and performance on top of that. Pale Moon 27.4 fixes reported security vulnerabilities in the browser. It also improves the defense of the browser against threats further -- an ongoing project that the team calls DiD, Defense-in-Depth. DiD This means that the fix is "Defense-in-Depth": It is a fix that does not apply to a (potentially) actively exploitable vulnerability in Pale Moon, but prevents future vulnerabilities caused by the same code when surrounding code changes, exposing the problem. 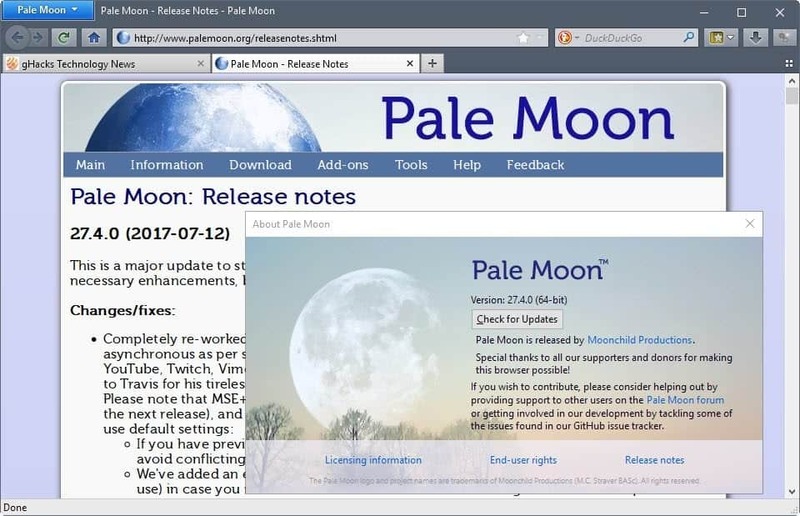 Pale Moon 27.4.1 was released on August 3, 2017 to the stable release channel. The update fixes media and web compatibility issues. It fixes a media playback issue that caused high CPU usage and/or choppy playback for HD videos on sites like YouTube as hardware acceleration was not used properly. Pale Moon 27.4.2 was released on August 22, 2017. It is a smaller update that fixes several security issues in the client and addresses stability issues. The new version fixes a number of crashes and a browser hangup. The security fixes either update components that Pale Moon uses, fix existing vulnerabilities, or improve the browser's defense against threats. Pale Moon 27.4 is an important update that users of the web browser should install asap. It fixes several known security vulnerabilities, adds more controls to the browser, and improves support when it comes to streaming video on the Internet. Now You: Have you tried Pale Moon recently? What's your take on the browser? Good to see that the Pale Moon team is actively working on the browser. I am quite sceptical regarding its future though, since Mozilla is in the process of abandoning technologies the Pale Moon team tries to keep afloat (such as XUL/XPCOM, NPAPI, single process browsing…). Next year is going to be interesting for sure. It certainly will be. I am bouncing between the Nightly v56 (which actually is quite nice), and Pale Moon, which is still working for me for now. But I’m just being cautious and ready to jump to whatever is next. Always glad to use this browser. I would have been on Chrome now if it wasn’t for Pale Moon around. Thanks Moonchild and his team for their hard work. As much as I would love to use it as my day to day browser, I’m always worried about the fact that they are such a small team that they might not be able to fix bugs/leaks/0-day stuff that even some big companies take some time to fix. Personally I’d trust a small team more than some of the multinational companies, not only do they react quicker to vulnerabilities but because the software normally has a smaller user base it presents a smaller target to ne’er do wells. You only have to look at how long it’s taken some of the big companies to fix known vulnerabilities to realise they care more about public image than keeping customers safe. Yup, they’ll go the way Fossa Mail and Cyberfox will. One-man team, the guy dies or calls it quits. Then your left holding the bag. I’ve been using it for over 5 years and this has never been a problem. 2010 called and wants it’s user interface back. Well I like using it with the FoxE9 plugin (to give Pale Moon an IE 9 like appearance. Pretty snazzy actually. But Firefox Nightly is looking nicer with the Photon progress. Plus as long as I’m able to use UserChrome code to place the tab bar below the address bar, I’ll be happy. No, we can keep that advanced, customizable interface. Trying to avoid changes to FF, I’ve stuck with version 50.0.2, but lately it has been giving me grief, hanging, freezing, etc. So I started back with Pale Moon, which I gave up some time ago because of issues with Flash. Whenever I need Flash, I have to go back to FF. Sigh. Guess I’ll update Pale Moon and try once more to get Flash to work. How is it that you’re not getting Flash to work with Pale Moon? I’m using v27.4 and Flash works on my system. FF 50 was a sucky buggy version. I have found 44 to be very stable, 45 also pretty good and 52 if you need later features. Over 25% of FF users are sticking with versions 52 or lower with 40 being the most popular of those for some reason, so you are certainly not alone in your situation. Palemoon is just old FF (24) rebranded with a handful of tweaks. I think they have 3 casual coders (Mozilla has a staff of 5000). Its just marketing to pretend its a separate browser. I heard they were updating to FF38 even though they claimed they would ‘never, ever’ switch to Australis. Anxiously waiting for proof that Australis is coming to Pale Moon and they share 99.9% of code. It was already apparent, but your last sentence there clearly shows you don’t know what you are talking about. Of particular amusement is your notion of coding: someone grabs a chunk of let’s say Firefox “29 and 38” and makes a clone browser. If you even bothered to think and double-check before writing blurb, you would know that Australis is *never* coming to Pale Moon (https://www.palemoon.org/roadmap.shtml) and that they are indeed *very* different browsers now. Note: *now*, not some 8 years ago when Pale Moon was released when indeed they were similar (and Firefox was Firefox, not a Chrome-clone to be). Aaannd. There went FF, just as I finished above post. How do you change the default User Agent String in Pale Moon ? The default User Agent string seems to “fingerprint” Pale Moon users … because PM is an unusual browser relative to what most people use on the web. There are three compatibility UA modes built-in: Native, Gecko and Firefox, these can be changed on the fly, a page refresh will activate the change: (Alt) Tools > Options > Advanced tab > General > Compatibility. I find Native is fine for ~95% of my browsing, which can vary enormously from day to day. Go to about:config and type useragent into the filter bar and you’ll see that there are already a number of modified User Agents added on a per site basis that you could use as a basis for adding a new string to ‘fix’ a problematic site. Palemoon is a failure today. Buggy as **** ! The only one buggy is Moonchild. how does one get a user-selectable string… without the PaleMoon fingerprint ? You might want to search for an extension to do that, I’m sure there are many available (uMatrix does it for example, although it’s not its main function). Worked for me on three different websites. Cool browser. Been using heavily it for the past couple of years – since ditching Firefox – with very few problems. I use it on linux with no problems. Best browser i have ever used and its better than chrome and firefox. SeaMonkey is superior to Pale Moon and more up to date and more secure. Pale Moon still uses some code from Firefox. FACT. And without Firefox, Pale Moon would not exist either. Have no issues whilst using SeaMonkey, Firefox, Waterfox, Cyberfox, and even K-Meleon. SeaMonkey still adheres to Gecko v48 (I think v2.48 is the latest). Now sure, Gecko v38 was used as a rebase for Pale Moon, but it does receive security updates. So there would be stuff patched in Pale Moon, that isn’t patched in SeaMonkey. I was last running SeaMonkey on a Puppy Linux notebook, and when v2.46 was released, it screwed up all of my font settings, and was much slower. Basically my profile was pooched. I switched to Pale Moon on Puppy and never looked back. What sites are you having issues with on Pale Moon? SeaMonkey is an archaic, old-looking browser that’s become mundane to use. Palemoon code is 99.9% Firefox. I am so sick of this LIE that it is a different browser. It does not run any faster, or any less memory than the version of FF on which it is based. I have run them side by side for comparison and there is no difference. Sites that don’t work on old FF don’t work on Palemoon. The only trolls here are the ones pretending its a different browser. You’re just generalizing. First off, I run a slow enough system, that I can see side-by-side what runs slower. It isn’t Pale Moon. And keep in mind I have no love loss for the development team. I find Moonchild to be arrogant and stubborn. A lot more of Pale Moon has deviated from Firefox than you give it credit for. Plus, a lot more sites do run on it than Firefox v38, which it’s interface is based. No one is trolling here. Just offering opinions. Please don’t be like Frank Lion or Malliz over at MozillaZine, and try to muzzle everyone. Truth is, I like the new Firefox 57 Nightly. I may move over to it at release time. But Pale Moon does have merit … for now. Don’t see this issue at all whilst testing SeaMonkey, Firefox, Waterfox, Cyberfox, and even K-Meleon . I’m in IT and have noted this on 12 test computers with different OSs and not just my personal computer(s) that I use at home. I use SeaMonkey on Linux every day for my personal use and have not experienced the issue that you have had. Sea Monkey is up to date and maintained and is a lot more secure than Pale Moon. I do not recommend Pale Moon to clients nor do I use it myself. Pale Moon IMHO is now mundane to use The earlier versions of Pale Moon were quite good. The newest version however isn’t. Right… so, to sum up: Pale Moon is an insecure browser (forgot to prove why but we’ll have to trust you) that badly renders ALL websites on ALL tested 12 computers and ALL different OSs, while ALL other browsers are working fine and safe. Nice attempt at slander but next time try with a bit more of sophistication… Oh, and you are in IT. I have to agree with you George. I’m not big on the Pale Moon team in the slightest, but even MozillaZine is vaguely familiar the UI font issues in SeaMonkey. And whilst they base SeaMonkey on a newer Gecko release, there are more current updates on Pale Moon. So BS-BS (oh wait, I’m sorry – BrBr – silly me) is being quite misinformative. If he has all of the issues with Pale Moon that he cites, then he should be fired from his IT job. It’s the UA string in Pale Moon that causes the issue(s) and the Goanna engine. Sites keep saying you have an outdated browser. Am not slandering Pale Moon at all. The earlier versions of the browser were very good. Good luck to the developer of Pale Moon. I respect both your points of view about Pale Moon but respectfully disagree with it and am not attacking either of you nor am I slandering Pale Moon. Just stating some issues we were seeing in our IT department with the newest version of Pale Moon. The earlier versions of Pale Moon were quite good. We do wish the developer at Pale Moon the best of luck. It’s the UA string in Pale Moon that is causing the issues and the Goanna engine. Am not here to slander Pale Moon FYI. Thought the earlier versions were very, very good. Good luck to the developer at Pale Moon. For clarification it’s the UA string for Pale Moon that causes problems. Didn’t mean to say ALL sites. Several banking sites e.g. Chase bank, Netflix, YouTube, Gmail.com Yahoo, Amazon, phpBB.com, etc. I have used palemoon for months with no issues.Incidentally i could list sites which will not render in chrome or firefox too. Also dont forget that palemoon does not share ALL the same firefox code so some security updates dont apply to it.Take this information back under your bridge troll. I have sort of mixed thoughts about it all. As of this moment. Pale Moon is running fine for what I need. But i know another site compatibility issue is just weeks away (you can almost set a watch to it). I tried running Waterfox for a month and I really liked it (using the CTR add on of course). I will say that Pale Moon was slightly faster. But I do think that Waterfox must have a better future. Now I’ve tried the latest Firefox nightly (with some Photon elements enabled. I kinda like it. It was very stable. I actually like the mockup screenshots of Photon. If only tabs could go underneath and I could add a status bar, I’d actually be perfectly happy. If Palemoon or any other browser is not working the way they are supposed to it may have to do with the machine you are using. I have this with mine where a few reputable programs just don’t want to perform the way they are supposed to. Bitdefender free and the new Vivaldi browser for example don’t like my machine. Good points. How old is your machine? I myself use Bitdefender free(many years now) and the new Vivaldi browser works fine on my computer. Also have tried Pale Moon current update with less than satisfactory results. Did like the earlier versions of Pale Moon. Wish the developer of Pale Moon the best of luck. Just because someone has a different opinion about Pale Moon and is seeing concrete issues does NOT make them a troll. And Pale Moon does indeed contain a lot of code from Firefox and is seen by many sites as an out of date browser. And not every browser is perfect either. And why are so many people reporting issues about using Pale Moon here e.g. Ghacks and at a lot of other sites? The earlier versions of Pale Moon were very good ,but, since the updates many people are having issues with it. And no I am not speaking for all users of nor does that make me a troll nor am I slandering Pale Moon. I do wish the developer of Pale Moon the best of luck.